Every car has a cup holder, but not every car has a built-in Bluetooth speaker. That was the insight that drove Gus Jockers and the team at iCreation to invent speeCup—a portable speaker that looks for all the world like a travel mug, fits in any standard size cup holder and is full of cool audio features compatible with your smartphone. Thanks to voice enabling and motion sensing technology, there’s no need to touch speeCup to turn up the volume, a simple command or hand gesture is all it takes. Its integrated microphone cancels incoming noise to ensure your callers can hear you clearly. But speeCup is not just for talking on the phone, it has a Bluetooth range of 30 feet and a rechargeable ion battery for up to 20 hours of music playability. It comes with 3 cables so you can plug it into your computer, 12v car charger or stereo system. 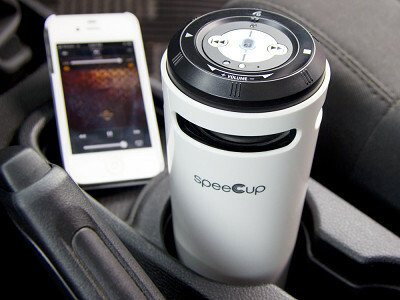 Anywhere there’s a cup holder and even places there aren’t, speeCup is sure to come in handy. We’ve seen it used in backpacks, strollers, poolside and of course on your office desk. 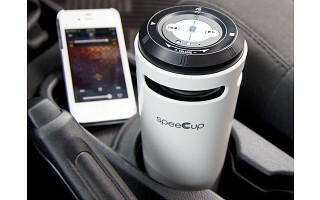 speeCup is handsfree, but that doesn't mean you won't find yourself reaching for it over and over again. 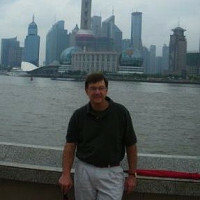 I love music and our company is in the engineering and manufacturing business. When looking for new product ideas I thought of the various Bluetooth speakers I purchased and listened to and said - "There has GOT to be a better way." We know electronics, we have audio engineers on staff - let's design a really good high end speaker we can be proud of! Oh, and let's see how quickly we can bring a brand new product to market starting NOW! GO! Hi Alison. There are 2 types of user interface available. In the center on the top is a Siri or S Voice button. Press it once briefly and it is immediate access to everything your iPhone/Galaxy or tablet can do by voice commands. From making a call to giving turn by turn navigation to setting up a reminder or sending an email through voice dictation. The other is using the gesture control. Wave you hand to change the music track up or down. Or, if you're listening to music and a call comes into your phone wave your hand to answer and then you're speaking and listening through speeCup and your phone is just the interface. Does this have the ability to plugged into 110 outlet with the converters that come with iPhone and ipad. Absolutely! We intentionally do not include yet another converter in our box. We feel people's drawers are already filled with them. We recommend charging with the iPad 110V/0.5A converter because it will charge faster. We did include a 12V car adaptor in our box because we put 2 USB connections on it. We were thinking sometimes less is more! Every car has a cup holder, but not every car has a built-in Bluetooth speaker. That was the insight that drove Gus Jockers and the team at iCreation to invent speeCup—a portable speaker that looks for all the world like a travel mug, fits in any standard size cup holder and is full of cool audio features compatible with your smartphone. Thanks to voice enabling and motion sensing technology, there’s no need to touch speeCup to turn up the volume, a simple command or hand gesture is all it takes. Its integrated microphone cancels incoming noise to ensure your callers can hear you clearly. But speeCup is not just for talking on the phone, it has a Bluetooth range of 30 feet and a rechargeable ion battery for up to 20 hours of music playability. It comes with 3 cables so you can plug it into your computer, 12v car charger or stereo system.